A gem of a villa for a honeymoon, or two couples sharing, in a private luxury estate of just six properties. Situated on a quiet headland of white sand in the south west of Koh Samui, giving panoramic ocean views from all quarters, an infinity edge lap pool, and access to the beach - it all adds up to the ultimate in tropical holiday locations. 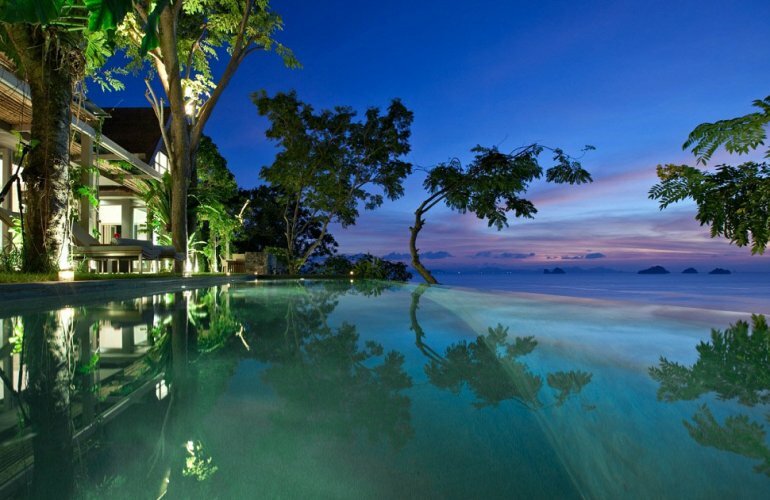 Located within a small exclusive community of six luxury villas on tranquil Taling Ngam beach, the views from this villa could not be bettered: across the glittering Gulf of Thailand, to the Five Islands and Ang Thong National Marine Park. And of course its position on the west coast of Koh Samui means that the sunsets are absolutely glorious. Sitting above the beautiful white sand beach of Taling Ngam, the villa offers a stylish holiday home on several levels for one or two couples. Its modern, cool decor, the use of natural materials, white and cream furnishings, the fold-away glass walls opening to connect the inner villa with its outside, give the property a bright, airy and cool simplicity. The headland is an escarpment, with access to the beach provided down several steps leading from the estate, and the villas are built on several levels into the incline. The whole area remains a tranquil place of natural beauty, and local tropical flora, yet it is within easy driving distance of all that Koh Samui has to offer visitors. The villa is fully air conditioned and each of the main rooms opens onto a verandah with stunning sea views. There is complimentary Wi-Fi Internet for guests to use throughout the property. The imposing entrance to the beautifully landscaped grounds is on the lower level, and you are immediately walking up through natural stone walls to the lawns, pool and pavilion area, where the views hit you at once. The pool itself has a submerged bench seat and decking furnished with a parasol and sun loungers for relaxing and taking in the stunning scenery. The two thatched pavilions, for living and sleeping, are situated just behind the pool. The first pavilion is for sleeping, and has two en suite bedrooms. Both offer great sea views, built-in wardrobes and indoor-outdoor en suite bathrooms with garden rain-showers. One has a double bed, and the other has two singles. Both rooms can open up their fold-away glass front wall to the verandah outside giving those fabulous views across the pool to the ocean. A central, planted courtyard separates the first pavilion from the second, which houses the open plan sitting, dining and kitchen area. With its double vaulted ceiling and the fold-away glass walls on all sides, this area is truly a wonderful space for relaxing, entertaining, and taking in the scenery. The living area has comfortable L-shaped sofa seating and a dining table for six. The kitchen is fully equipped and features a white island breakfast bar. Outside at the back of the central courtyard garden is a staircase leading up to a mezzanine level above the kitchen and overlooking the living room. This area has a sofa bed, bean bags and a satellite TV/DVD system. There is also an adjacent en suite bathroom. Curtains can be drawn across the opening to the living room below providing full privacy, allowing the space to be used as an extra bedroom if required.